“The Hire Dynamics Contact Center Executive Forum is one of the best events for contact center professionals to share best practices, ideas, challenges and other experiences with peers and counterparts from outside their own organizations." 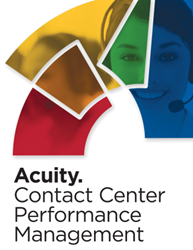 TouchPoint One, provider of the Acuity Contact Center Performance Management solution, announced today that it will sponsor the Hire Dynamics 2014 Atlanta Call Center Executive Forum taking place Wednesday, June 4th, 2014 from 11:00am-1:00pm at Villa Christina in Dunwoody. The forum is an information and networking event exclusively designed for Contact Center management to discuss Best Practices, gain knowledge, stimulate community awareness and raise call center perception. Leaders that attend are involved in strategic decisions and tactical execution of small to large (Fortune 100) companies. During this highly informative event, TouchPoint One will showcase Acuity, its hosted (SaaS) Contact Center Performance Management solution. In addition to peer networking and catered lunch, the 2014 forum welcomes guest speaker, Dr. Tim Elmore, who will be presenting the latest trends from Generation Y and explain how organizations can effectively recruit, train and retain this emerging generation. Dr. Tim Elmore is the author of more than 25 books, including the best-selling Habitudes and the founder and president of Growing Leaders, a non-profit organization created to develop emerging leaders across the globe. With more than 30 years of experience and expertise in generational leadership, Dr. Elmore provides corporations, civic organizations and universities with the tools they need to help develop young leaders who can impact and transform society. Attendees will leave the session armed and energized with expert insights and solutions for the critical challenges facing contact centers today from some of the industry’s recognized front-line leaders. TouchPoint One, LLC provides innovative performance management solutions to the world’s leading contact centers. The Company’s Acuity product is a hosted software solution (SaaS) that enables clients to leverage disparate systems data and integrate proprietary business logic to create a complete and accurate view of the contact center operation. Acuity combines reporting, scorecards, alerting as well as a range of communications tools into powerful role-based analysis and management dashboards that enable team-wide alignment, provide functional performance visibility and accountability, and ensure fluid, proactive workflow between all contact center stakeholders. Founded by veteran call center executives, TouchPoint One is committed to delivering solutions that equip and empower contact center personnel, increase customer satisfaction and loyalty and maximize business investments and performance while reducing risk. Hire Dynamics is the largest staffing provider in Gwinnett County and second largest in Atlanta for contact/call centers (regularly staffing over 60 centers), manufacturing facilities, logistics/e-commerce operations, and office positions. Hire Dynamics operates out of nine offices with an additional 16 on-site locations. Our placements range from short-term contract to high volume direct hire. We put over 3,200 people to work every day and in 2013 placed over 1,200 Hire Dynamics associates in full-time positions with our clients. Among Hire Dynamics' numerous recent awards and accolades include being named a Top 5 “Best Staffing Firms to Work For in the U.S.” (Out of 10,000) for four years in a row (Staffing Industry Analyst) and the Winner of Inavero’s 2014 “Best of Staffing” award voted on by both our clients and talent – Hire Dynamics received a Net Promoter Score (NPS) of twice the industry average, ranking in the top 1% in the industry and Seven-time Pacesetter Award winner for being among Atlanta’s top growth companies (Atlanta Business Chronicle).